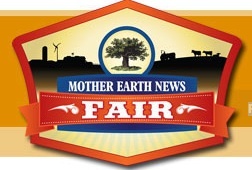 Meet Us at The Mother Earth News Fair this Weekend! The following post is by Katie Peige, Herban Lifestyle’s Sustainability Associate. This weekend, Herban Lifestyle will be exhibiting at the Mother Earth News Fair in Seven Springs, Pennsylvania. Tickets are $35 at the gate for a three-day pass or $20 for one day. By using this coupon, you can get $10 off those prices. Sounds like we are going to have a blast. I hope you can join us this weekend to get your State-Fair-Fix-with-a-twist. Mmmm pass the raw cultured veggies and vegan goodies this way! This entry was posted in craft show, eco-friendly, environment, Fall, food, green, health, herban lifestyle, natural, organic, travel, wellness, workshop and tagged craft show, farming, festival, Mother Earth News, sustainability by YourStellarSelf. Bookmark the permalink.